The Equicentral System is a more responsible method of horse management developed for the needs of today's horse owner, their horses, and the land on which their horses live. The Equicentral System was developed to combine elements of equine management into a sustainable system that saves time, money and effort and increases the health of your horses and your pasture - a true win-win-win scenario. People all around the world are now utilising The Equicentral System and it has been shown to have many positive effects on the well-being of their horses and the health and productivity of their land. By using this sustainable management system, not only has the physical health of their horses improved but owners are observing much calmer and more relaxed behaviour in their herds. The way in which many people currently keep horses is not sustainable, meaning that it is costing more to keep them than is necessary, it is having a negative impact on the land and is creating an unnecessary workload. In many cases, the way in which horses are kept, is also detrimental to a horse's mental health. The Equicentral System is system that works by utilising the natural and domesticated behaviour of horses to both their own, yours and the wider environment's advantage. This is combined with good land management practices to encourage and support the health of the pasture. You may have heard the term you are what you eat - the same applies to your horse, if they graze a healthy pasture they are much more likely to be healthy. Once you get a basic understanding of how The Equicentral System works and the many benefits this system can provide you should be able to think of ways that you can incorporate it or elements of it into your own horse management system. So how does The Equicentral System work? 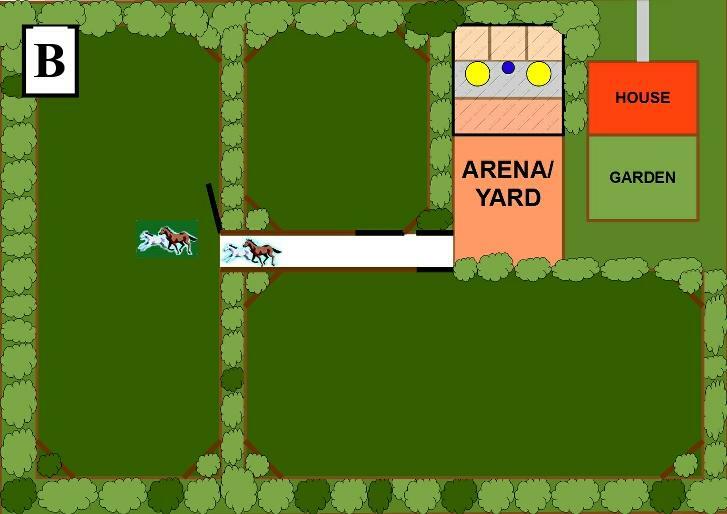 With The Equicentral System all the pastures (fields) are linked to a communal surfaced yard area (dry lot/loafing yard) by gates. Ideally, we avoid narrow laneways or tracks as these compact the soil (picture A), but of course, this is not always possible, and some properties will need to have laneways to take the horses out to the paddocks (picture B). Let's presume that currently the horses are being kept in the large communal yard overnight (with hay). In the morning the gate is opened to let them out of the communal yard. The horses walk themselves to the pasture that is currently in use and carry out a grazing bout (this usually last about two to three hours). During this time, they are free to return to the communal yard for a drink although they usually do not bother until they have finished grazing. 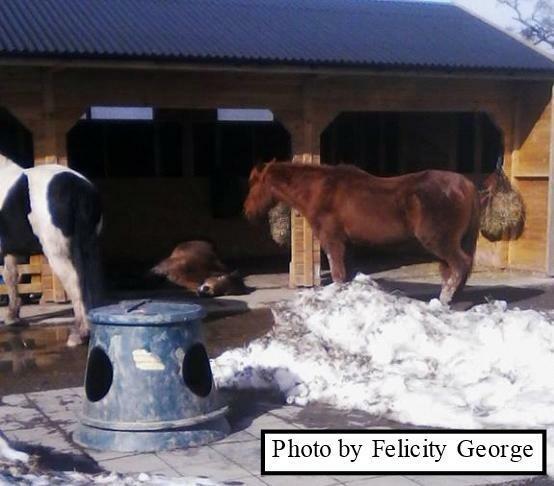 After the grazing bout has finished the horses return to the communal yard for a drink. The yard is also where the shade/shelter is situated and is a safe, comfortable place to be. This copies what horses do in the wild, travelling between where water/food/shade/shelter is, albeit for less distance in the domestic situation. After drinking, the shade/shelter and a soft surface in the communal yard encourages the horses to rest through the middle of the day (loaf) before returning to the grazing area for another grazing bout in the afternoon. At the end of the day the horses return to the yard to await you and any supplementary feed that they may be receiving. The horses can then either be confined to the yard overnight or can be given freedom to move between the yard and their pasture overnight, just like they did through the daytime. In this system horses are never locked in a pasture, but they are sometimes locked out of it. Access to each pasture is rotated, allowing each pasture time to rest and recover. When conditions on the land are unsuitable for grazing, for example too wet or too dry, you can increase the use of the yard to prevent damage to the pastures and soil. The land will then make a much quicker recovery when conditions improve. 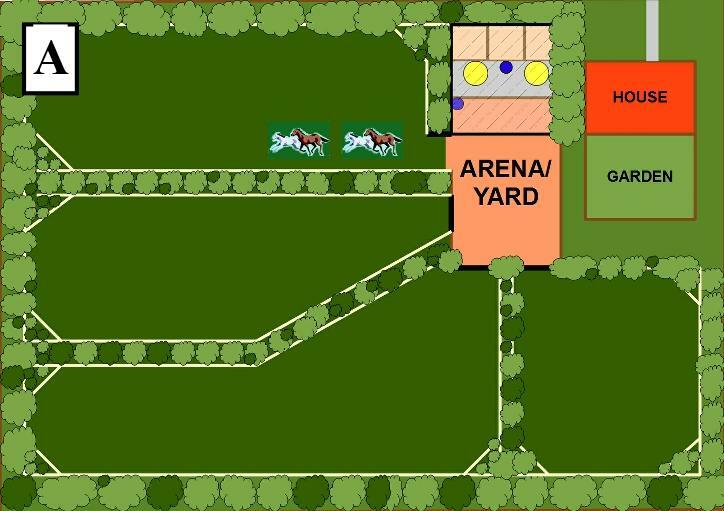 The Equicentral System encourages the horses to return, rest and congregate in an area that has been designed to cope with the loafing behaviour of horses (unlike the pasture). You do not have to go and get them. This is particularly handy if you have to see to your horses in the dark after work. It encourages horses to move more (the water is only in the communal yard). Of course, this may not be very far on a small horse property, but it is better than no movement at all. When the grass is dryer the horses may have to walk backwards and forwards several times during the day for a drink. It all adds up! Minimizes mud and dust. Horses do not hang around gateways waiting to be fed or let back in. This 'standing around in the gateway behaviour' causes soil compaction and bare areas.